Stan Kopala, The Godfather of Greylock, known for his outspoken style, can-do spirit and love of snowmobiling, passed away Tuesday, June 27, 2017 at Berkshire Medical Center-North Adams. 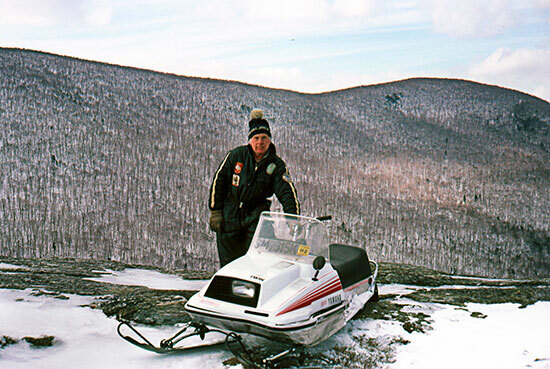 A dedicated member of the Snowmobile Association of Massachusetts, Stan also served as a member of the Greylock Advisory Board, starting in 1975, the longest serving member known. An avid photographer, the cover of the first three SAM maps featured Mt. Greylock, all taken by Stan. He helped organized the annual 100 Miler Ride from 1977 to 1988, only missing one year due to a lack of snow. In 1994 Stan was presented the SAM Snowmobiler of the Year Award, in 1997 he was honored as SAM Trail Worker of the Year, and in 2011 he was again honored with the President’s Award by Dan Gould. He was a safety advocate, and promoted snowmobiling in the local media, informing them of events and projects that bettered the community. Stan was a veteran of the Korean Conflict having served with the United States Army until receiving his Honorable Discharge as Sergeant on October 29, 1954. Following his discharge he worked for various construction companies building the flood control system in Adams. He then owned and operated Stanley J. Kopala and Sons Builders for 55 years. He is survived by his daughter, Nancy Clermont and her husband Eric of Adams; two sons, David Kopala and his wife Pamela of Bennington and John Kopala of Springfield; six grandchildren, Stephanie Dix and her husband Daniel, Jacqueline Hoffman and her husband Ryan, Eric W. Clermont, Jr., Steven Clermont and Matthew and Julia Kopala; two great granddaughters, Sierra and Hazel; his brother-in-law John “Bobby” Dubis and his wife Patricia, his sister-in-law Elsie Dubis, his longtime friend David Smachetti and his beloved cat Tina and many nieces and nephews. He was predeceased by three sons, Steven, Joseph and James Kopala and by his brother Chester Kopala and his sister Jessie Dziegiel.